The Dance Center of San Antonio offers pre-professional training that provides your child with the necessary preparation for a career in professional dance. DCSA's pre-professional training program is open to students ranging from ages 6 through 18 and consists of 2 divisions, the After School Program and Day Program. The After School Program is designed to give students the best possible foundation, focusing on the development of technique, esthetic and artistry, as well as to instill a love and joy for dancing. In addition, it is our goal to help students develop work ethic, confidence, and leadership skills to prepare them for whatever their future may hold. The Day Program provides essential training to our most advanced and dedicated students - dancers in this division meet during the day to allow for increased hours of training as they work to perfect the skills learned in the foundational levels. For the Day Program students, there is a greater emphasis on mastering their artistry and performance, with a goal to prepare them for professional careers in dance. Please read below for further details and highlights of our program. We would love to be a part of training your child for their future! Lucy Hassmann was recognized as the Youth America Grand Prix Winner at the YAGP Chicago Regional Competition in 2018. Lucy was also the first female dancer from San Antonio to be invited to represent the United States in the International Ballet Competition USA in Jackson Mississippi in June 2018. Lucy was also personally invited, along with DCSA dancer Mackenzie Kirsch to compete in the Vaganova Prix 2018. All pre-professional students are trained in the Vaganova technique by experienced teachers, including artistic director Vanessa Bessler who was named "Outstanding Teacher" by the Youth America Grand Prix in both Houston and Austin in both 2016 and 2017 and in Chicago in 2018 and 2019 as well as Lauren Ader-Cumpston. The Vaganova training method continues to produce the world’s best dancers and is founded on a codified technique and curriculum that develops the necessary strength, flexibility and artistry required for a professional career in dance. The Vaganova method of training builds a dancer by teaching the fundamentals of placement, strength, flexibility and technique in stages that are appropriate for a dancers age and development. Dancers progress each year to a new level of training that builds upon the previous years training, producing dancers who are ready to enter the professional world of dance upon completion of the program. Ballet classes for Pre-professional students include Ballet Technique, Pointe and Variations/Repertoire. Through our program, we also connect students with various dance personalities from the national and international stage, providing invaluable contribution to their development. For a list of our Guest Master Teachers, click here! Kate Thomas has been recognized numerous times at YAGP with 1st, 2nd and 3rd places in the classical and contemporary categories. Kate is also the first dancer from San Antonio to pass to the final rounds of the New York YAGP Finals held at the Lincoln Center in New York City. 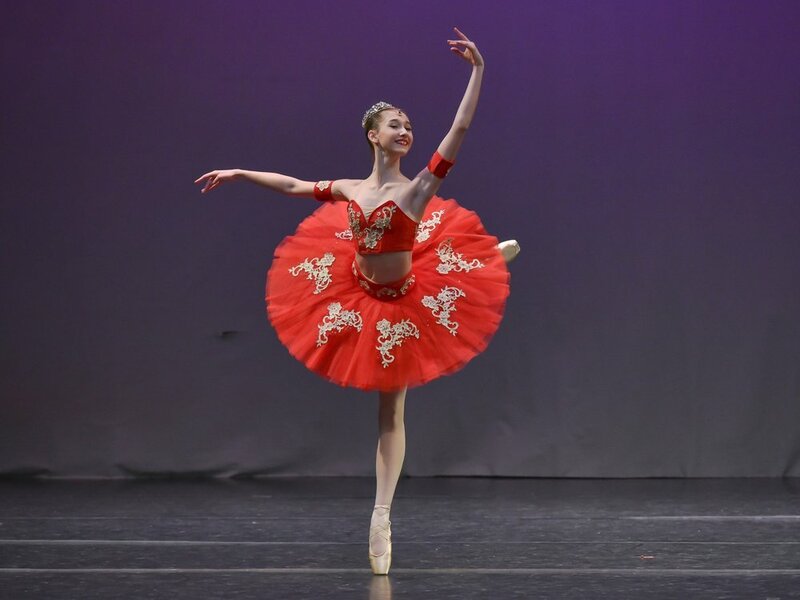 Mackenzie Kirsch is the first dancer from San Antonio to be selected to compete in the prestigious Prix de Lausanne competition in 2019. She was also one of only 10 American dancers to be selected. In addition, she and DCSA dancer Lucy Hassmann were personally invited to compete in the Vaganova Prix in 2018. Mackenzie has also been awarded 1st place in Classical categories at YAGP regional competitions. Students in the Pre-professional program are also given the opportunity to participate in unparalleled performance opportunities through The Children's Ballet of San Antonio where students participate in full length Professional level productions and have the opportunity to work with internationally renowned ballet masters as well as with local choreographers. Pre-professional students are also encouraged to participate in high-level competitions such as The Youth America Grand Prix to assist in developing performance skills, artistry, and technical excellence. Our students have received numerous awards at the YAGP competitions and scholarships for Summer Intensive Programs including the Bolshoi Academy, Houston Ballet, National Ballet of Canada, Harid Conservatory, Oklahoma City Ballet, and Kansas City Ballet, New Generations Ballet, and Burklyn Ballet . Our students have also been invited to attend the year-round training program at the Bolshoi Ballet Academy and Houston Ballet Academy. For a full list of our awards and recognitions please click here!